Patients with cerebral aneurysm ruptures that develop large hematomas (either intracerebral or subdural), especially those with significant mid-sagittal structure shift and in poor clinical state, are considered in general to be candidates for an open surgical rather than endovascular treatment, for decompression in addition to ruptured aneurysm treatment(12,17). Complex hemodynamics at the apex of an arterial bifurcation induces vascular remodeling resembling cerebral aneurysm initiation. Role of the bloodstream impacting force and the local pressure elevation in the rupture of cerebral aneurysms. To take this one step further, therapies that mitigate the effects of low estrogen level and fluctuations may decrease the risk for cerebral aneurysms," Dr. 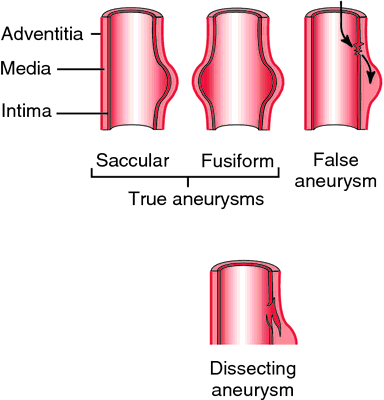 Moreover, the entrance to most cerebral aneurysms is considerably wider than are medial defects, so the relatively abrupt media termination at the sac entrance must be acquired. About 25 percent of people who experience a ruptured cerebral aneurysm die within one day, and another 25 percent die within three months of the rupture. 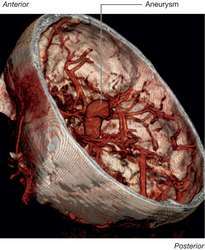 Coil Embolization is a procedure used to occlude the cerebral aneurysm, preventing its rupture. Key words: Subarachnoid hemorrhage, Cerebral aneurysm, Cerebral angiography by helical computed tomography, Cerebral angiography by digital substraction. Certainly, if you have a cerebral aneurysm, it could rupture at any time, so this case could have been a coincidence,'' said Neil Martin, a neurosurgeon at UCLA Medical Center. O'Brien D, O'Dell MW, Eversol A: Delayed traumatic cerebral aneurysm after brain injury. Hindley is suffering from a cerebral aneurysm, caused by an artery swelling at the base of the brain.